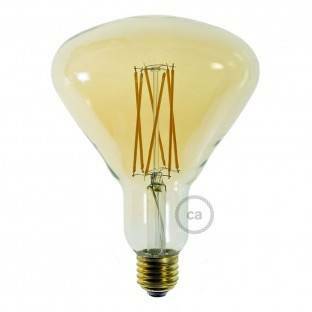 The dimmable XXL LED Golden Light Bulb - Pear A165 Curved Double Spiral Filament - 5W is the new standard of giant light bulbs. We have worked hard to improve one of the best-selling products of our catalogue: we replaced the carbon filament with a curved LED filament which assures the same allure but with a consumption of only 5W(instead of the 100W of the previous models) and greater brightness (400 lumen versus the 240 lumen of the previous version). We chose a dimmable version, which allows you to adjust the intensity and create different atmospheres. We replaced the E40 fitting with an E27, to make them compatible with all of our pendant lamps. 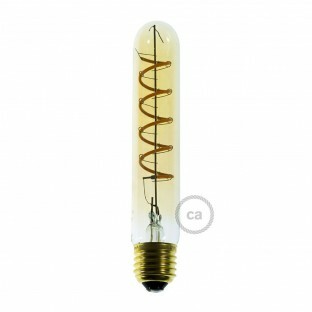 The result is a striking bulb that is both beautiful and functional. Time to reach maximum light intensity: 0 seconds.